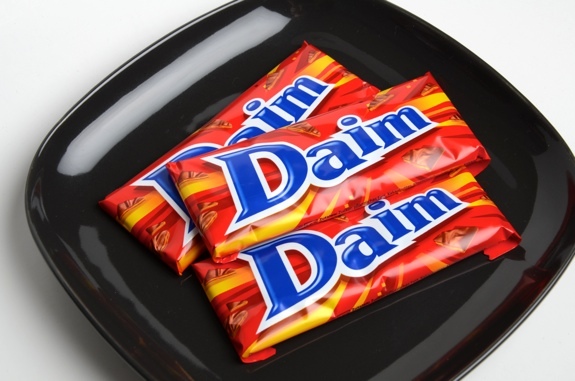 A plate of Daim chocolate bars. Colourful wrappers, and a tasty snack inside. I’m not sure what it is about milk-chocolate-coated crunchy caramel almond bars, but Sweden seems to love them. At least that’s what I gather, based on regular trips to Ikea. If you’re the proud owner of a Poäng chair, you may have tried Daim chocolate bars at the Swedish food store, or a slice of Daim cake at the Ikea restaurant. You, being particularly observant, may have noted that Daim is a Swedish version of Hershey’s Skor chocolate bar, that “skor” is Swedish for shoes, and that the Swedish crown emblem is front and centre on the Skor bar packaging. 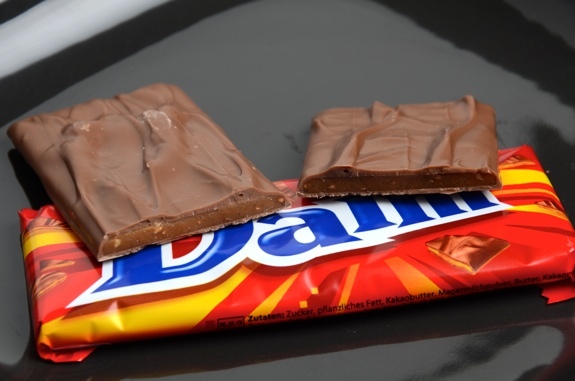 The Daim bar has a soft milk chocolate shell, which hides a hard caramel centre laced with almonds. It’s hard enough that it can be snapped in half, and it crunches in your mouth before dissolving. It’s got a buttery, milky, burnt sugar flavour to go with the toasted almond flakes. It’s not bad at all. For the sake of comparison, I tried a Skor bar side by side with a Daim, and I think I like the Daim more. The Daim has more of the heavily toasted almond taste than the Skor, which has a lighter almond profile. The chocolate is seemingly a touch darker on the Skor, and the Daim is a bit more sweet and milky. That’s about all the differences I could come up with. For anyone keeping Skor, they’re practically one and the Daim. A Daim chocolate bar, split in two. See the thin layer of crunchy caramel in the middle? Cost: $1.99 for a three pack of 28-gram bars at Ikea. Value for cash money: Pretty good. Availability: Where there’s an Ikea, there’s a source of Daim bars. Nutrition? : 150 calories per 28-gram bar. There’s some calcium, but there’s also a fair bit of fat. Why would someone name a chocolate bar “Shoes”? : I don’t know. Why would someone name a band The Hives?